If you're seeking a Hotel Conference Venue in regional New Zealand's beautiful countryside, perhaps we can help. M-Power Accommodation offers a 'no cost, no obligation' conference venue finding service to conference organisers and over the years we've gathered lots of experience, contacts and satisfied customers. Contact us by phone (+61 2 9318 2361), online enquiry form or by e-mail. If you need advice or suggestions for your next New Zealand conference or meeting we'd be more than happy to help. 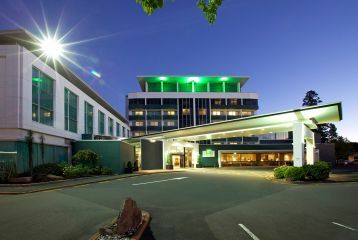 Holiday Inn Rotorua is popular 4.5 Star hotel and conference venue located in the centre of New Zealand's North Island - a 3 hour drive from Auckland. Holiday Inn Rotorua offers conference organisers meeting rooms and well-appointed accommodation adjacent to the Whakarewarewa Thermal Reserve and the Historical Living Village and within easy access to a picturesque and unique natural environment. 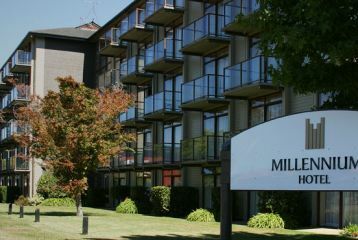 Millennium Hotel Rotorua offers a great destination and first class facilities for your next conference or business meeting. This hotel is a 4.5 star conference venue that sits on the edge of Lake Rotorua giving conference delegates some beautiful scenery as well as the opportunity for some memorable activities. Millennium Hotel Rotorua features a selection of air conditioned conference rooms, the largest of which can seat 350 people in a theatre style setting, while the accommodation is spacious and comfortable with many rooms offering lake views.